Home > Safety Signs > Hazard Warning Signs > Machine Hazard Signs > Caution Dust hazard symbol and text safety sign. Caution Dust hazard symbol and text safety sign. Caution asbestos symbol and text safety sign. Caution dangerous chemical symbol and text safety sign. Dust mask must be worn in this area symbol and text safety sign. Emergency shower symbol and text sign. Respiratory protection must be worn symbol and text safety sign. Wear dust mask symbol and text safety sign. Caution Dust hazard symbol and text sign. 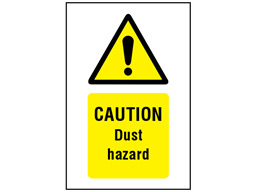 Part of our hazard warning safety sign range, to warn of the dangers at work from inhaling airborne dust particles and fibres. These contaminants can cause a range of illnesses including asthma, lung diseases and cancer. These particles can be found in gases, sprays and vapours; solid particles from mineral, metal or chemical processing; vegetable dusts (wood, flour, cotton); and moulds and spores. Warning safety signs. Caution Dust hazard. General hazard safety sign, comply with ISO EN 7010, Safety Signs and Signals Regulations 1996, and the Control of Substances Hazardous to Health Regulations 2002 (COSHH). WS3100 Size 150mm x 100mm. Material self adhesive vinyl. WS3101 Size 150mm x 100mm. Material rigid plastic. WS3102 Size 300mm x 200mm. Material self adhesive vinyl. WS3103 Size 300mm x 200mm. Material rigid plastic.